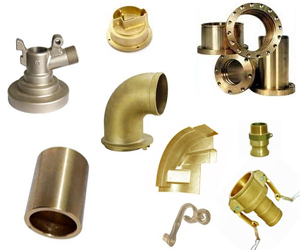 Bronze investment castings are widely used in machinery, ships, automobiles, constructions and other industrial sectors. In terms of the material, bronze investment casting include the following four types: tin bronze, lead bronze, manganese bronze, aluminum bronze and so on. Due to its small volume shrinkage, tin bronze can be used to make complex casting requiring accurate size and decorative pattern requiring clear handicraft. Normally the elements of zinc, lead and phosphorous can be added into bronze casting. Since phosphide has high hardness, wear resistance and good abrasive resistance, the phosphorus content of tin bronze casting can be as high as 1.2%. Zinc can improve the liquidity of alloy and reduce the segregation of tin bronze. Lead can significantly improve the wear resistance and cutting of the alloy. So bronze casting can be used to make wear-resistant and corrosion resistant parts. Due to its high mechanical properties, corrosion resistance and abrasion resistance and good liquidity, lead bronze can be used to make the castings with high density. Normally the elements of aluminum, iron and nickel are added into the manganese bronze and then the alloy will have the property of corrosion resistance and heat resistance. It will be suitable to make parts working in high temperature. The elements of iron, manganese and nickel are added into the aluminum bronze casting and it will be suitable to make high strength and corrosion resistant parts. According to the client’s requirements, the bronze lost wax casting will be made through sodium silicate process or silica sol shell process.